I published the first 5 smug and lazy toddler activities over the summer. And I think, as it turns out, that everyone needs more smug and lazy toddler activities in their lives. 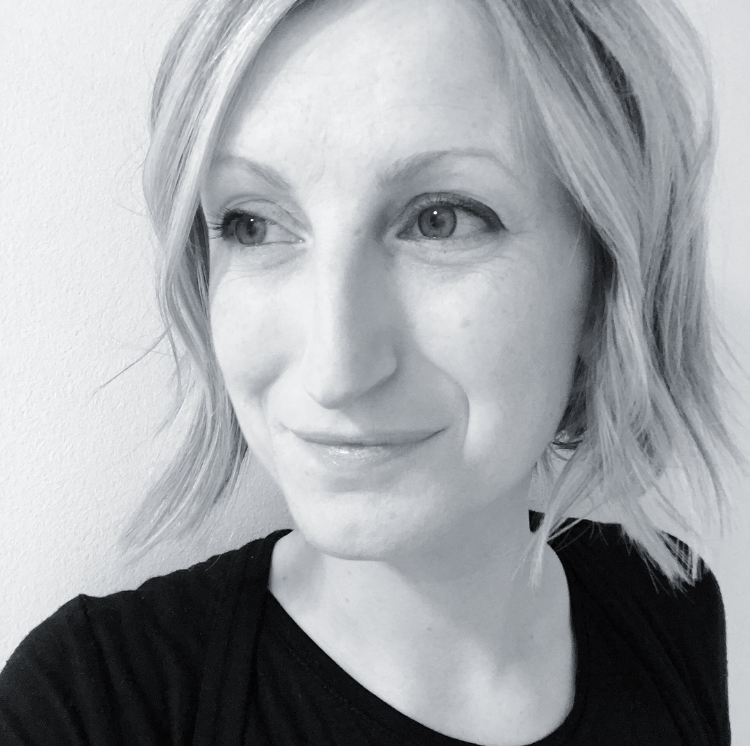 With the caveat that by ‘everyone’ I mean everyone who lives with a toddler – otherwise setting these activities up would be neither smug nor lazy, just a plain old waste of your time. 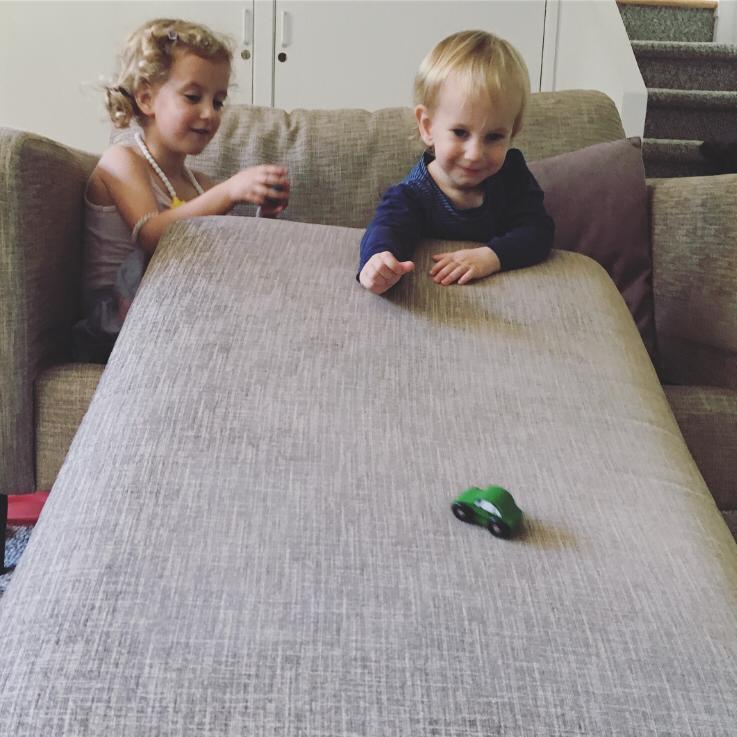 That said, if you do have a toddler but you don’t have the time (or inclination) to spend painstakingly getting activities ready that they will play with for about 10minutes before preferring to bash the wall with a plastic spoon, then the following will be right up your street: 5 (more) smug and lazy toddler activities! 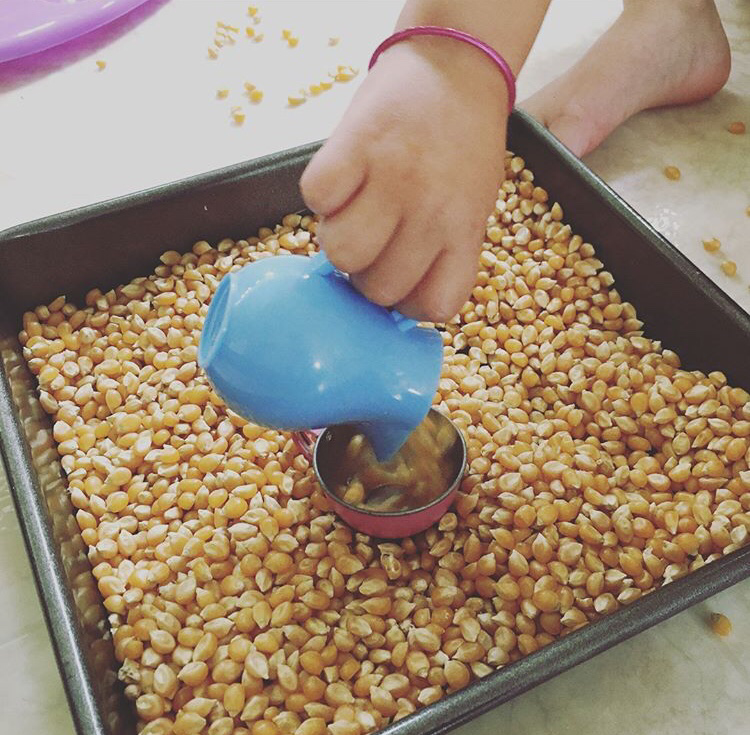 An excellent sensory play filler for the under-3s; puffed rice (known to the rest of us as Rice Krispies). 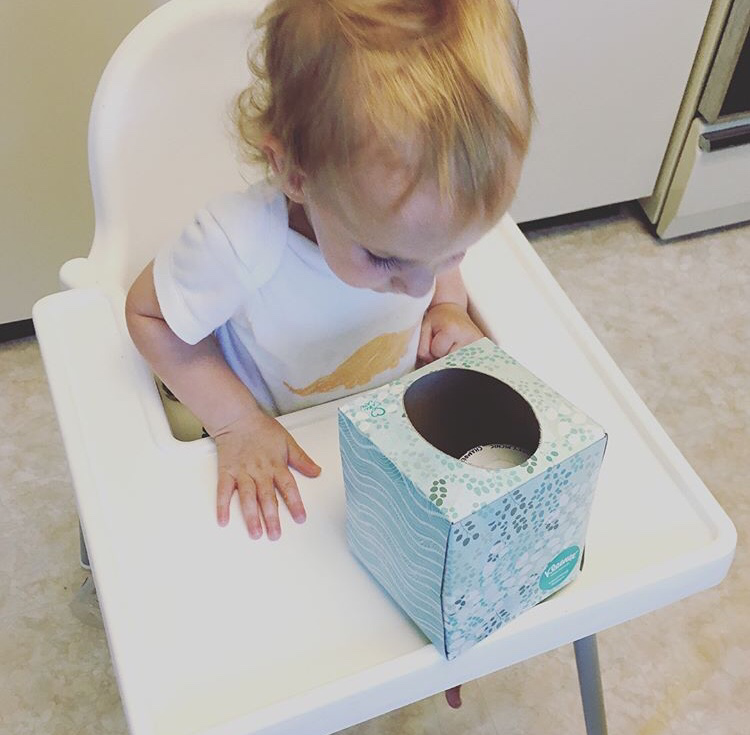 I’ll give this to you straight: this is a super easy and fun highchair activity, but there will be some serious vacuuming to be done at the end. The good news, though, is that your toddler will spend a solid happy 20minutes playing with this while you make supper. I used an egg tray purchased last Easter that has been used for everything from bead-sorting to painting. 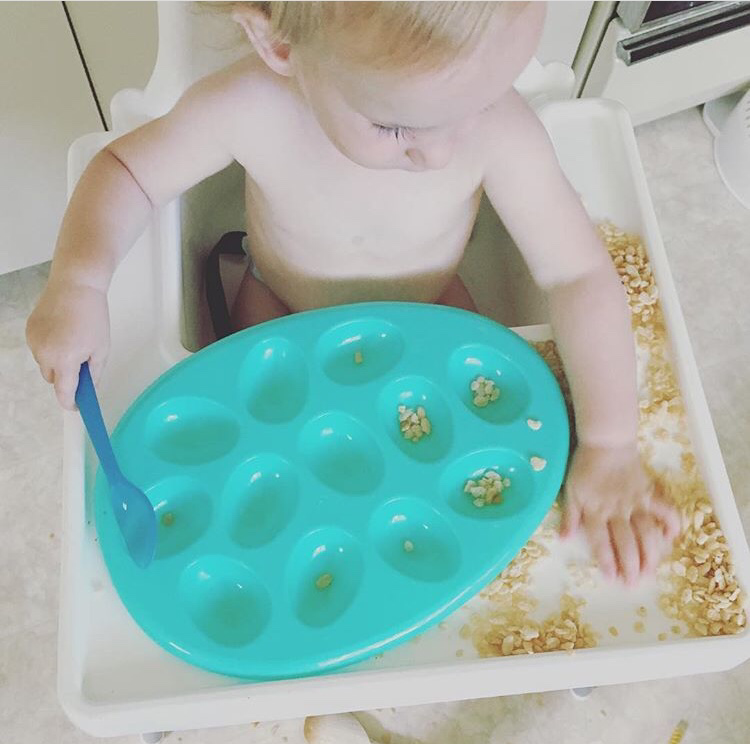 Wilf (1) had a blast spooning the Rice Krispies into the dimples on the tray, dumping them back out, crushing them, eating them, and making patterns on the highchair. I added a variety of spoons and little cups as he went to keep his interest levels up. He also enjoyed throwing them around and posting them down into his seat, so probably not one to set up just before your guests arrive, but a classic nonetheless. Mim (3) also requested a tray. This was a super quick and easy solution helped along by an impulse Costco buy of a giant vat of popcorn kernels which, as it turns out, is impossible to use up before the best-before date. Who knew popcorn had a best-before date anyway?! Costco lesson learnt. Anyway they were a novel sensory play filler for a 3 year old who can be trusted not to eat them; felt nice and made an excellent noise when pouring into a toy tin teacup set and being stirred around a baking tray. 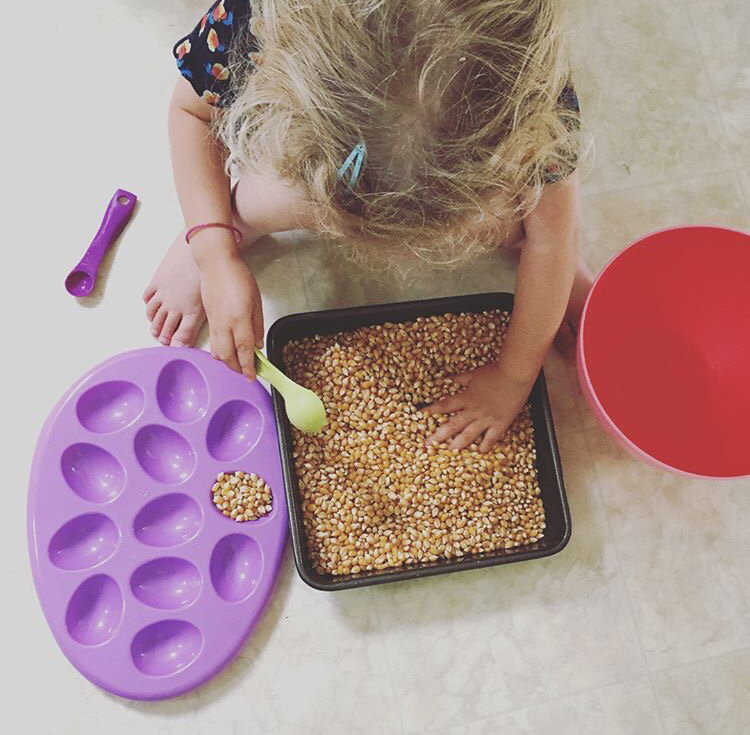 I kept it simple and gave her a couple of containers, a tea set and jug, and the ubiquitous egg tray (an ice cube tray or muffin tin would do the job perfectly). This prompted a happy 30minutes serving tea to various dolls, some careful pouring and measuring for mixing and baking, and a serious challenge for the dyson afterwards. 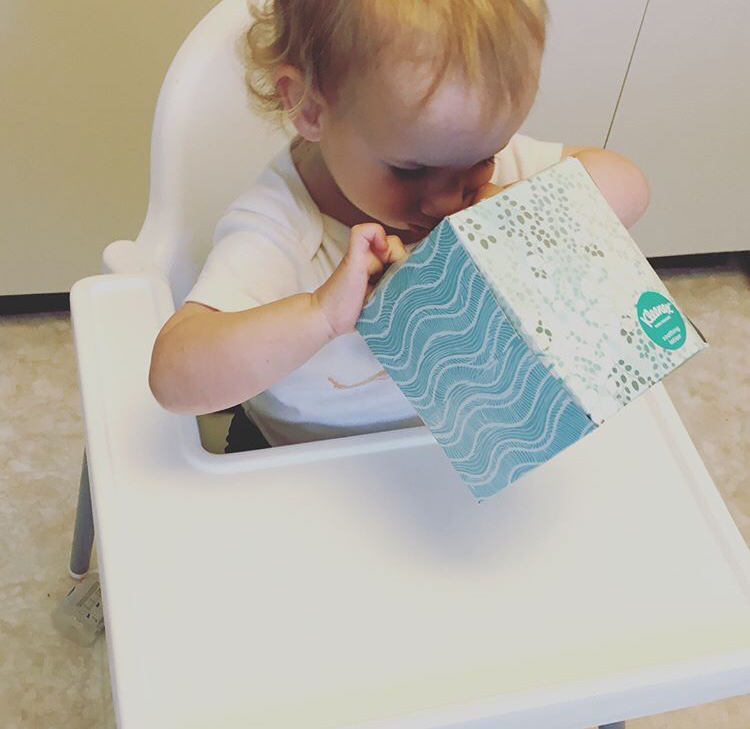 Wilfred (1) would have been thrilled if this had just been a full box of tissues for him to shred but I’m not sure that would count as a particularly baby friendly activity. So instead, I filled an empty tissue box with a variety of fun objects – a cup lid, a sealed new container of cake decorations, a measuring spoon, a small car, etc. A super easy way to make normal toys a bit more entertaining. A couple of glugs of oil in a ziplock bag (baby oil would be great but I only had olive oil to hand – also fine). Followed by a few drops of food colouring – I used a dark blue and green. 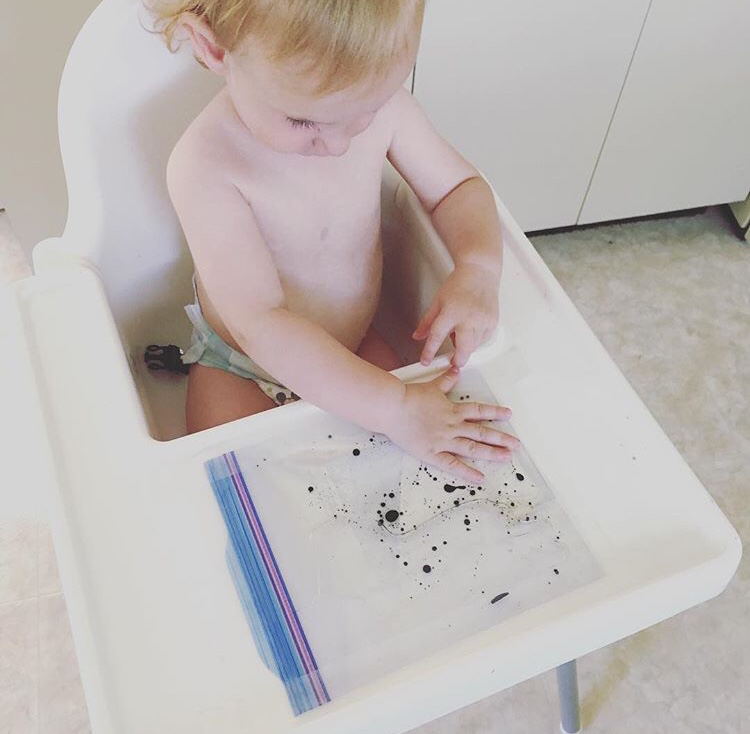 Sealed up carefully and taped to the highchair and he spent a happy 15 minutes pushing the colour around, watching the drops break down. Admittedly the last few minutes of entertainment came from attempting to unstick the bag (danger zone) and then from watching his older siblings play with it for him. But overall, a smug and lazy toddler version of those slightly lame office desk toys. 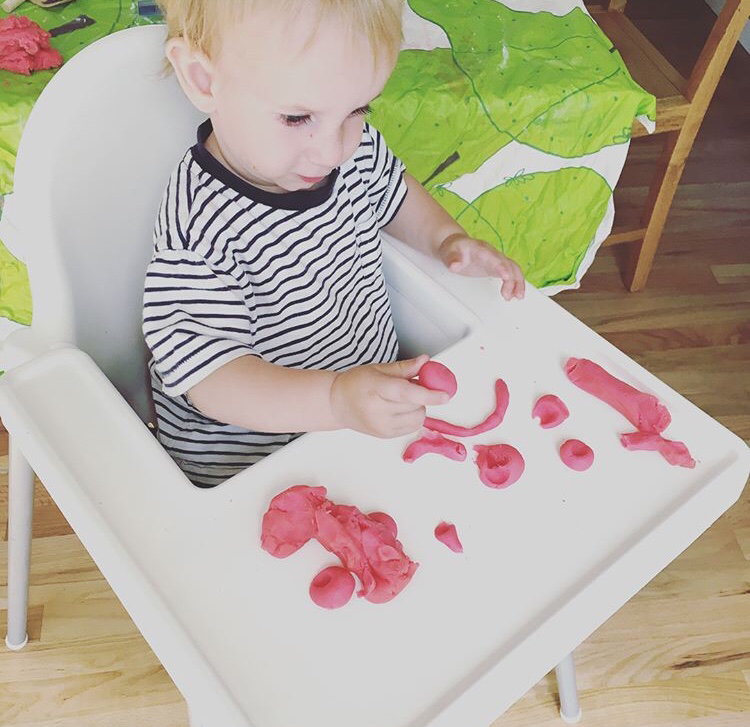 I let Wilf loose with some homemade play dough while the bigger children were busy with liquid watercolours… it required some serious supervision as he was pretty pretty keen to eat rather than play with it. This is where homemade play dough really comes into its own – partly because you know what’s in it (no nasties) but also because it tastes so disgusting it should at least be mildly off putting, eventually. 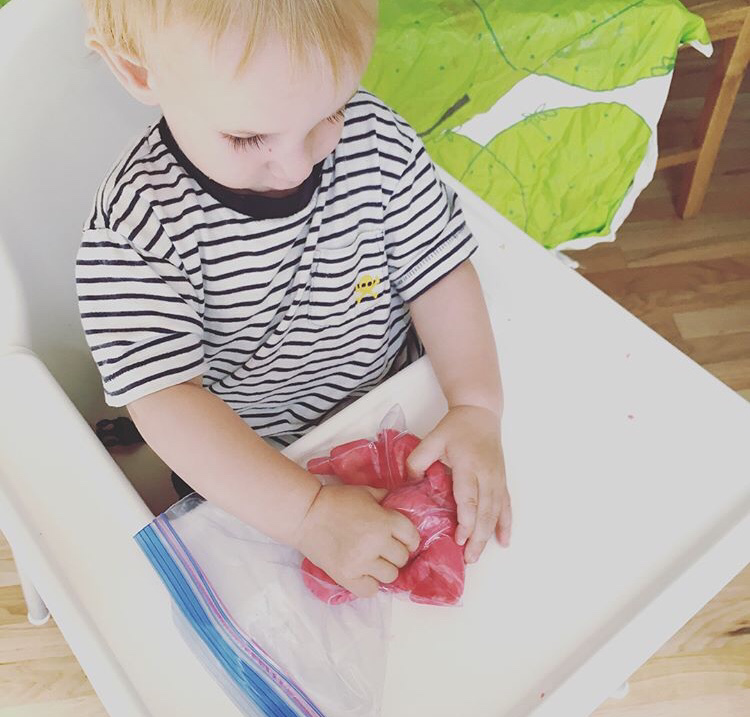 For now though and a moment where the other children needed my help I ended up sealing the play dough in a ziplock for him to play with – no chance to eat it, and he was still totally intrigued. And look if all else fails and you got up at 4.30am and feel like it is an aching effort just to focus your vision let alone get ziplock bags out and convince your toddler to sit in a highchair (hypothetically) then you can always pull the sofa cushion forward as a makeshift car ramp with a big box of cars at the bottom and let them play. Less on the smug, more on the lazy, but still a winner every time.